By now most of you who made New Year's Resolutions, have broken them. 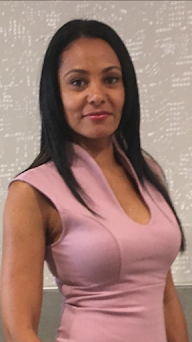 I'm here to say it is never late to make a healthy change. February can be the month to make those changes. My son’s school made changes in the lunchroom. They wanted parents to be conscious of what we as parents feed our children. They sent out a list of junk food that is not allowed in school for lunch. No more Takis chips or cupcakes, gummy worms are allowed. Yes, being a parent and working at a school I have seen kids eat these items for lunch. This changed my mindset because I can make my kids lunch better by making better choices in what I buy. I want my family to have a healthier lifestyle. While searching online I came upon the Shanti Bar. I received the Shanti Sample Pack to try out. Shanti Bar was created by Ashanty Williams and Lauren Feingold in 2012. They combined their backgrounds in culinary arts and sports fitness. They had two goals; one was to create clean, raw, natural foods to nourish our bodies and to make it delicious. As you know, some superfoods are hard to swallow. Ashanty and Lauren had an idea! They created this energy and protein bar that are tasty. 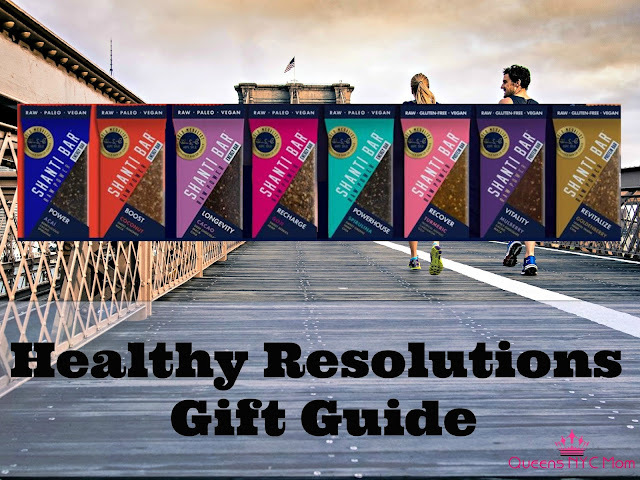 The ingredients are 100% organic, plant-based ingredients, spices and nutrient-rich superfoods (like chia and hemp seeds, acai, spirulina, and cacao.) Shanti Bar is high protein, nutrient-dense superfoods for everyday eating. Shanti Bars have no refined sugars, no preservatives, verified Non-GMO, USDA Organic, Certified Paleo, Gluten Free and contain 7g to 17g of protein. Which equals to #RawPower. BOOST COCONUT is packed with nutrients, like coconut and maca. This energy bar provides 7g of plant-based protein. Coconut is not only delicious and creamy, it is also known as a fat-burning agent. LONGEVITY CACAO - A soft and chewy chocolate brownie without the guilt and powered with health benefits. We have combined the wonderful Cacao taste mixed in with the libido enhancing Maca and the hydration powers of Chia in one scrumptious energy bar that contains 8 grams of plant-based protein. POWER ACAI - A rich and decadent Açaí Bowl bursting with berries and super foods. This is packed with antioxidants, nutrients and fatty acids to keep your hair and skin healthy and hydrated from the inside out. This powerful ingredient list showcases an abundance of super foods that are high in antioxidants, vitamins and the minerals such as Zinc, Vitamin C, Vitamin E, and Biotin. POWERHOUSE SPIRULINA - combines the wonderful detoxifying properties of Spirulina with the Omegas of Hemp and the Hydration of Chia. One SHANTI BAR POWERHOUSE SPIRULINA packs in 80% of your daily recommended intake for Vitamin A. This green wonder Energy Bar provides the body with vitamins, essential fatty acids, and minerals making it a great option for a fast recovery with 9 grams of plant protein. RECHARGE GOJI BAR is bursting with only organic, raw and nutrient-dense ingredients. This bar contains 8 grams of plant-based protein providing long-lasting energy and satisfaction. This sweet and delicious Energy bar is loaded with amino acids, Vitamin C omegas, protein, and over 21 trace minerals. RECOVER TURMERIC is jam-packed with exotic flavor and nutrient-rich ingredients. Goji Berries for glowing skin, Turmeric for anti-inflammatory properties and Cardamom for a digestive aid, Chia Seeds for a rich source of calcium, and Hemp Seeds for an excellent source of Omega 3 and 6 fatty acids. Enjoy 17 grams of plant-based protein with this tropical delight. REVITALIZE GOLDENBERRY is packed with vitamins, minerals, antioxidants and other life-giving properties that heal, energize and rejuvenate the body and the mind. With 17 grams of plant-based protein, this bar is perfect as a meal replacement or post-workout recovery. It is jam-packed with nutrient-rich ingredients such as goldenberries, chia seeds and hemp seeds ready to boost your immunity and strength. VITALITY MULBERRY gives you the energy-giving powers of mulberries along with the prized antioxidant properties of cacao and enriched with the libido enhancing wonders of Maca. Every last inch of this SHANTI BAR is exploding with nature’s goodness boosting your levels with vitamins, minerals, and 17g of plant-based protein. My kids and I have sampled all of the Shanti Bars above. My son's favorite, as well as mine, is the Coconut Bar. 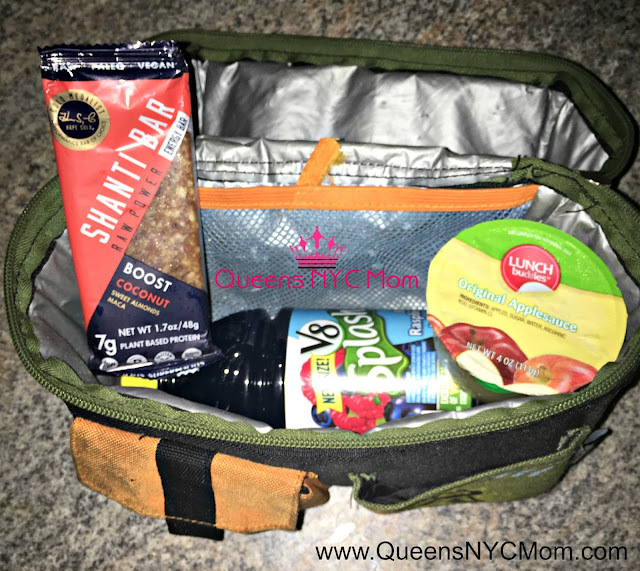 I put a Shanti Coconut Bar in my son's lunchbox. It's perfect for lunch and as a snack for him after school. This is my go-to protein bar after a quick workout at home. Shanti Bars taste delicious and are nutritious. By the afternoon, I need something that can recharge me that is not loaded with a ton of sugar. As we all know, sugar will give a temporary kick but fades. I grab a Shanti Bar and it gives me the peace of mind knowing what I put in my body is healthy. Shanti Bars are sold individually and as variety/party packs. You can purchase Shanti Bar online and at Bed, Bath & Beyond, Christmas Tree Shops, Whole Foods Market, and Harmon Face Values. Follow Shanti Bar on Facebook, Twitter, Instagram, Google Plus and YouTube for more information and promotions. These sound like a great healthy snack! I'm always looking for things like this that I can throw in my purse and eat on the go. OH I would love to try these! They sound like a great option to keep in my gym bag! Ooooo now these sound like a great snack option!!! I might just have to check them out for myself! What a great snack option. Always can use more ideas for when I'm on the go. The biggest drawback with health food products is that they taste gross. I'm glad these two ladies combined thier skills to make a yummy bar. It's so hard to find protein bars that aren't loaded with sugar or other ingredients that make them taste like tree bark or plastic. I've found a few I like, but I'm always curious to try new bars, especially when they have good ingredients and taste good too. I would love to try these. I like that they have no preservatives, and they are gluten free. I need healthy options like this that I can toss in my purse and go. I've never tried a Shanti bar before! I love that they have different bars for your needs. It's definitely a must try! There is a lot of nice flavors of these healthy bars! I'd love to give them all a shot! They sound good! I have never heard of the Shanti Bar before. It has some ingredients that I would like to add to my diet. such a great choice of snacks! i think my lunch bag will be replaced of something like this! That's good that a foot is being put down about the kinds of treats they can bring with their unch. Good choices make sense... it's not treating your kids really, to give them junk. The Shanti Bars have so many varieties! Yum! I didn't set any resolutions this year. I know myself and I knew I would have failed lol I did set some goals for a healthier lifestyle which includes going out more for walks. Were parents receptive to the changes? I've wondered how people would respond if we made similar changes. Showing them awesome option like the Shanti bar would help, I'm sure. It is about time that schools should implement that. Kids should eat healthy meals or snack for their body and brain. Energy booster healthy snack is a great help. 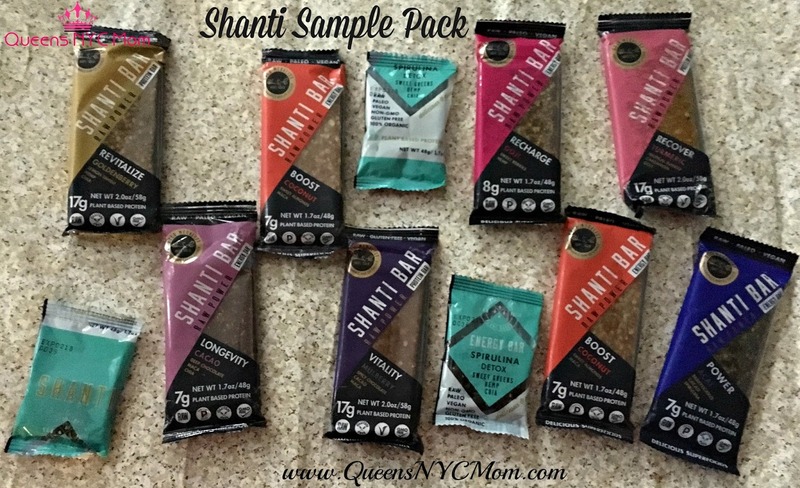 I hear about Shanti Bars for the first time, but I am in love with them right away and it is great to see we have so many flavors to try out. I would grab that Rehcarge Goji Bar, Turmeric and the one with Mulberry!